MVD Port Hostel i Montevideo, Uruguay: Reservér nu! The hostel also has a large TV room, grill, 2 computers for the exclusive use of guests free WiFi throughout the building. And so you can make your own food, the hostel has a kitchen with oven, stove, microwave, refrigerator and kitchenware, plus service bar with many drinks. 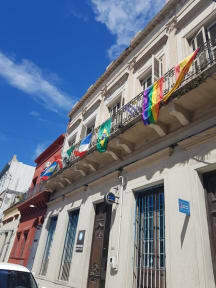 MVD Port Hostel is located in the Ciudad Vieja neighbourhood in the historic centre of Montevideo. 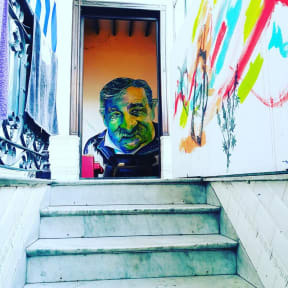 Nearby you can find many museums and buildings protected as historical heritage, such as the front of the hostel is the mumi (Museum of Migrations). In addition to being very close to an amazing point of reference is the Plaza Independencia. However, we are situated in street Bartolomé Mitre, 1535. MVD Port Hostel has privates and shared rooms, private rooms have air conditioning, cable TV, bathroom with shower. And also a balcony with a beautiful view to the coast of Montevideo. Private rooms the of 3-5 people. (Rooms have Queen size bed and 1 ½ size bed). The shared rooms, can hold the capacity of 12 people, single beds with shared bathrooms. Bathrooms are for males and females. Have many bathrooms through out the house. We provide house keeping every Day and also clean towels.